It’s been a while since we featured a cake topper, so I wanted to find a cute cake topper for today! And I think I found it. 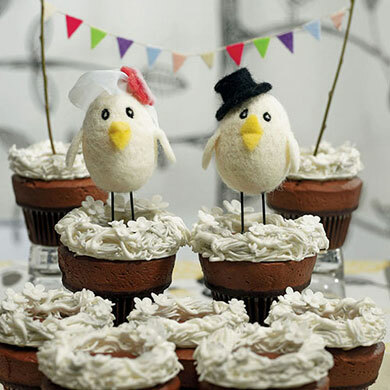 For some inexplicable reason I’m drawn to bird cake toppers. I don’t know why – I’m not particularly fond of birds as a whole. But every time I see a cute bird cake topper I just have to share it. And so I give you the “Sweet Tweets” bird cake topper. The bride birdie is wearing a “birdcage veil” (natch) and the groom is sporting a bird-size top hat. This cake topper would be perfect for at a rustic wedding reception, but it would also look great on most wedding cakes. You can find this adorable aviancouple here.